Reserved seat tickets can be purchased at JR Ticket Offices (Midori-no-madoguchi) and at Travel Service Centers (View Plaza). 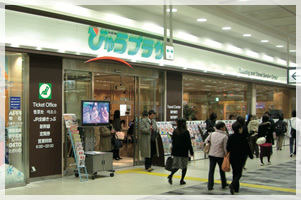 You can use your credit card at JR East Ticket Offices and Travel Service Centers. For shorter distance, tickets can be purchased at ticket vending machines. Note: Please purchase a ticket to your destination. Basic fare, Limited Express and reserved seat Green Car tickets for all Shinkansen and Limited Express trains throughout the country are sold at JR Ticket Offices. In addition to tickets for JR lines and other tickets, various event tickets are also available at Travel Service Centers. Tickets for shorter distances can be purchased from ticket vending machines. 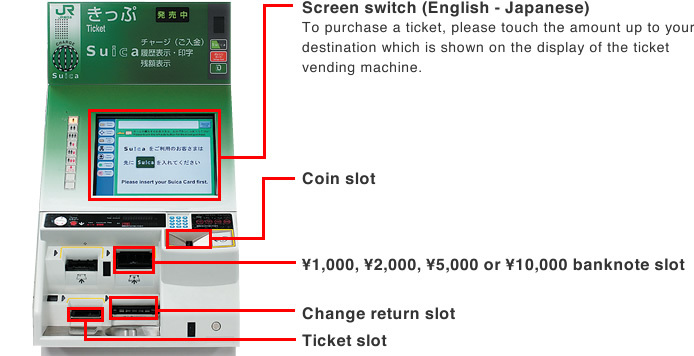 These ticket vending machines can accept up to six coins at the same time, allowing you to purchase your ticket quickly. Guidance in English on how to purchase tickets can be used. Banknotes in denominations of 1,000, 2,000, 5,000 and 10,000 yen can also be used.